July 1940. Berrien County, Michigan. 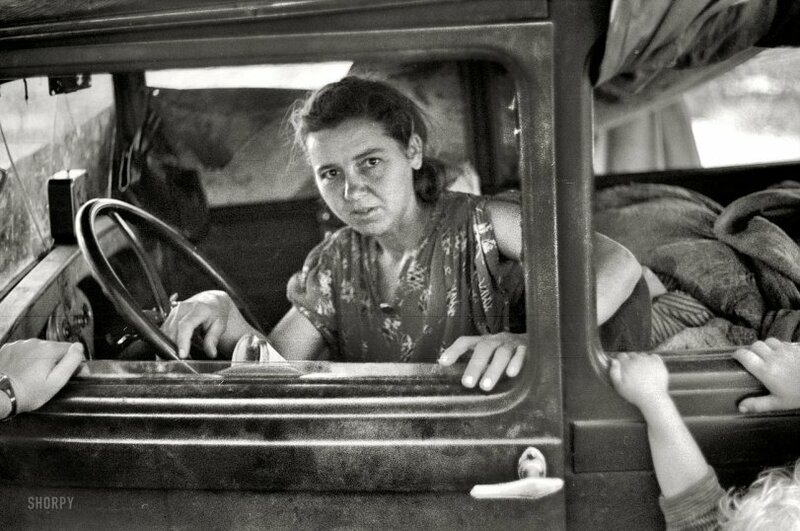 "Migrant woman from Arkansas in roadside camp of cherry pickers." 35mm nitrate negative by John Vachon. View full size. Submitted by switzarch on Fri, 05/20/2011 - 9:31pm. She might be "struggling to survive" but that face shows the determination and strength to carry on, despite the odds. Very inspiring. Submitted by Mr Mel on Wed, 05/18/2011 - 10:28am. A World War and full employment is just around the corner. When I say a better life ahead, I don't mean beyond. Submitted by chicagobob on Wed, 05/18/2011 - 8:45am. Their lacquer paint didn't hold up well without maintenance, but many are still on the road today, more than 80 years later. I drove mine to the station today. Submitted by wilso127 on Wed, 05/18/2011 - 8:06am. My great grandfather John C. Jackson came from across the lake at Lake County in Illinois to Benton Harbor in Berrien County, Michigan, in the mid-1870s and was a small-acreage fruit grower there until he died in 1896, 40-some years before this photo was taken. I suspect that he probably did his own harvesting back in those days, perhaps assisted only by younger members of his wife's Yore family in-laws who held far more acreage in the same area. Submitted by brewswain on Wed, 05/18/2011 - 3:23am. Shes sitting in a 1928 or 29 Ford Tudor. The Tudor sold in greater numbers than any other model. Submitted by dsanto on Tue, 05/17/2011 - 8:38pm. I don't like all of John Vachon's photos, but I like this one. The women in the photo is struggling to survive. One or two bad breaks and she could be dead. It reminds me how comfortable I am. How comfortable we are as a country. How we are only one or two generations removed from this woman and the troubles she had. Yet many Americans have no idea what America was like in the 1930s and 1940s. Back then, many Americans were in a life and death struggle to survive. Boy how things change. But I keep thinking that, with all of our wealth and comfort, we are still one bad break away from the plight of this woman. God forbid.